Sometimes only someone close to a killer can recognize them, unless that person comes forward -- and without DNA evidence – unsolved murders become cold cases that never leave the deep freeze. Consider the notorious killing of the "Black Dahlia," Elizabeth Short, whose remains were found dismembered with gruesome precision. There was speculation at the time the killer had to have possessed the skill of a surgeon. Years later, former LAPD detective Steve Hodel wrote a book identifying the most likely surgeon: his own late father George Hodel, MD. Another infamous 1947 murder also has long remained a cold case: the assassination of notorious gangster Benjamin "Bugsy" Siegel, remembered for opening the Las Vegas Flamingo, the first postwar mega-casino on the Strip. From the beginning it was assumed to be a mob-on-mob hit, but by whom? Investigators never could say for sure, even after one mob associate, Eddie Cannizzaro, told several people during his final years that he did it. NBC4News included that information while revisiting the Siegel murder for a segment of Hollywood cold cases last February. Then came a phone call from Warren Hull, the executive assistant at a Nevada law enforcement agency. "Forget Cannizzaro," Hull said, dismissing him as a suspect. Hull said members of his family learned the identity of the actual killer shortly after the Siegel hit, but kept it a "family secret," feeling no compunction to reveal it because the killer himself died only three months after Siegel. The killer, according to Hull, was a troubled World War II veteran who happened to marry the cousin and best friend of Hull's mother. His name: Robert MacDonald. "My parents both knew," Hull said. "On his deathbed, my dad asked me to research and tell the story." The mission has consumed countless hours of investigation and preparation of a 400-plus page Powerpoint presentation that Hull uses to make his case. Hull acknowledges the consensus conclusion that other mobsters wanted to get rid of Siegel. The Bug skimmed Flamingo construction costs and attracted too much attention, and mob higher-ups did not like him. Consensus is, the arrangements to take him out were made by the then-capo of organized crime in Los Angeles, Jack Dragna. Dragna had met MacDonald's mother-in-law, Gaynell Rockwell, during the years she worked in Los Angeles City Hall. Her daughter Betty Ann made it known she was in an unhappy marriage with a troubled and sometimes violent husband. "He's just out of control," said Hull, who said relatives knew that MacDonald was abusing drugs and alcohol, and perhaps worse, running up gambling debts to the mob. Dragna knew that during World War II, Army Lt. MacDonald had become an expert marksman with a number of weapons, including the .30 caliber carbine. "Dragna gets him involved. He says, 'Look, here's what's going to happen. Either do this and we wipe the slate clean, or you're going to pay me the $30,000 that you owe me,’" Hull said. 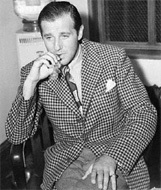 On June 20, 1947, Siegel was fatally wounded by a barrage of shots through a window of his Beverly Hills mansion on north Linden Drive as Siegel read a newspaper while sitting on the couch. Beverly Hills and Los Angeles Police, as well as the FBI, worked the case. They concluded the weapon likely was a 30 caliber carbine, but never officially identified the triggerman. MacDonald revealed to Hull's parents that he killed Siegel, Hull said. During his research into the law enforcement investigation after Siegel's death, Hull obtained an FBI memo that observed: "the killer obviously was a good shot." A witness at the time described hearing a car speeding north toward Sunset Boulevard. Hull believes MacDonald took a different getaway route. The mansion where Siegel died is only a few hundred feet from the edge of the Los Angeles Country Club. Hull's theory is that the former infantryman escaped on foot, crossing the golf course under the cover of darkness. Conveniently enough, the MacDonald house on Warner Avenue lay a short distance on the other side of the country club, and less than a mile from the Siegel house. But MacDonald's life was still in crisis. He sought psychiatric care. His wife filed for divorce. Three months after the Siegel murder, MacDonald used his Army spec .30 caliber carbine to kill Betty Ann and then himself. It made the papers, and Hull has a yellowed clipping. Reviewing the public record, Hull can find no evidence the investigators working the Siegel murder ever followed up the possibility MacDonald was Siegel's killer. So far as Hull can determine, ballistics never were run on MacDonald's carbine to determine if it was used for the Siegel hit that was so close in both time and distance. "It was worthy of investigation. They did not do it, because they did not have to," Hull said. Hull suspects there was pressure not to follow up, and that it came, directly or indirectly, from the legendary Howard Hughes, with whom MacDonald's father Archie had worked closely. The then-chief of Beverly Hills police testified to a grand jury. Afterwards, the foreman publicly described the need for a secret investigation into the Siegel death. "It had to be something of such importance," Hull infers. "Like the son of a wealthy businessman with ties to Howard Hughes, and whose mother in law had ties to city hall." If that's not enough of a theory, Hull has another: about the paternity of John Armstrong, who was conceived before the marriage of Betty Ann to Robert Armstrong. Betty Ann had revealed to confidantes she was not certain Armstrong was the father, Hull said. What's more, she had spent some time with the legendary lothario Howard Hughes. As a tagline to his PowerPoint presentation on the Siegel murder, Hull presents side-by-side photos of John MacDonald as he appears today and Hughes as he appeared in his later years.